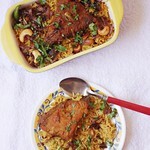 Sometimes my brain works like a parachute when I am stuck with ideas in kitchen. 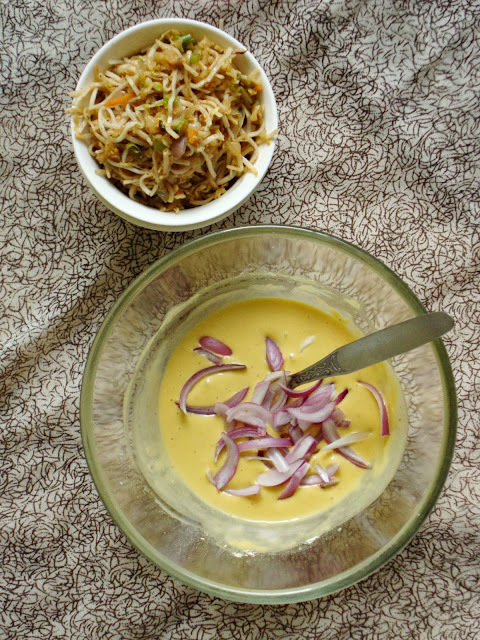 The background of my story is...I had left over vegetables noodles with me screaming for some makeover as no one at my home will eat what was served on previous night. 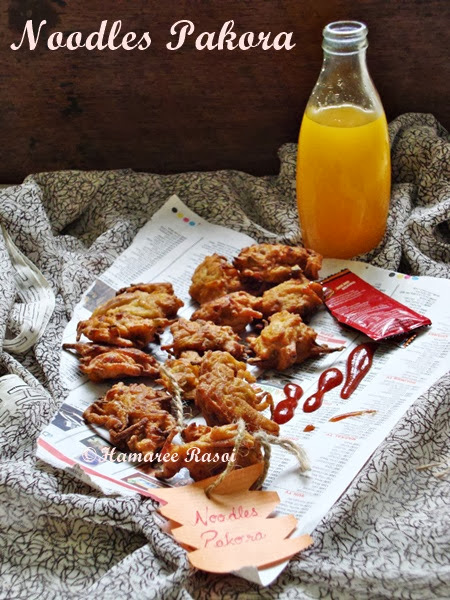 So my brain was racing to find a solution...An making pakora out of it flashed in my mind. 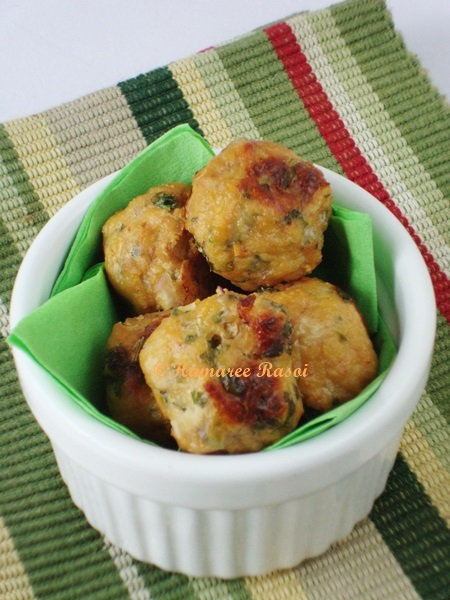 I googled to check if I am the only weird person to come up with such solution and found out there are people who have made Noodles Pakora ! So I mixed gram flour with some water to make a fine paste and added little seasoning. 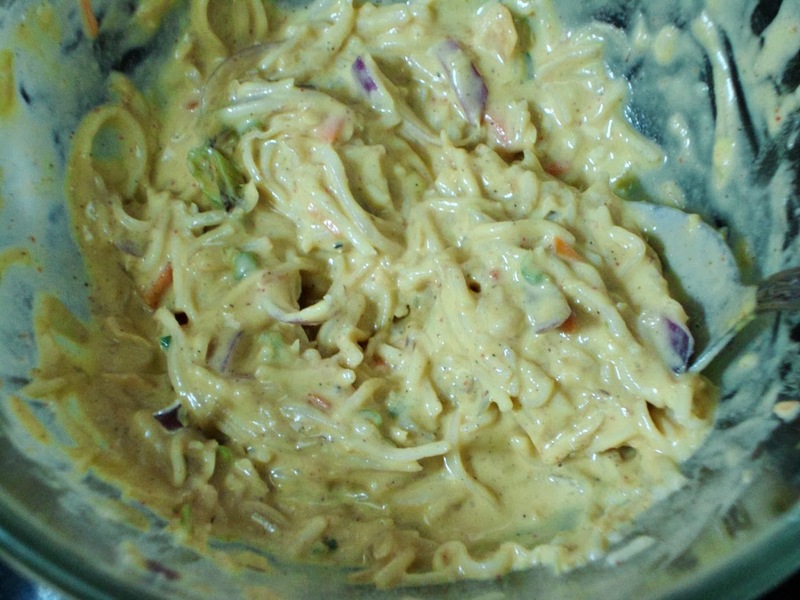 Tossed the leftover noodles and mixed well with a fork. Fried on high flame til they are golden and crispy. Believe me it was as simple as boiling milk ! 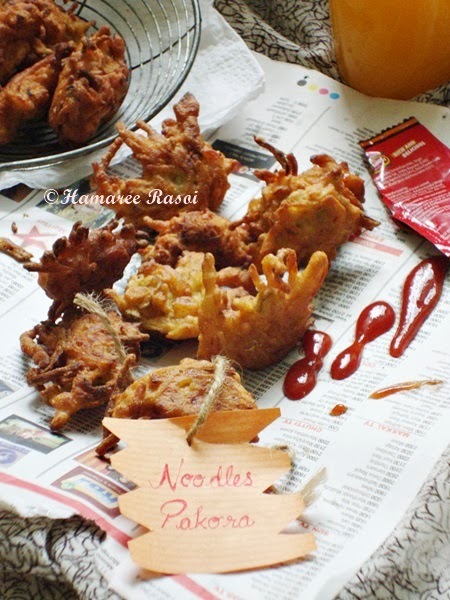 So try out this delicious Noodles Pakora and surprise your guests. 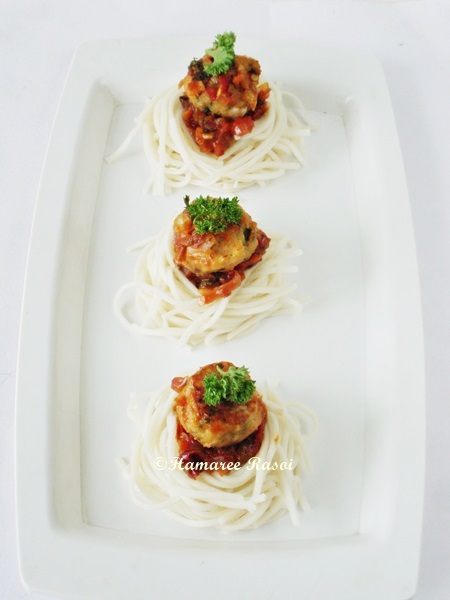 If you are making from scratch then boil noodles as per the instructions and chop some vegetables of your choice. 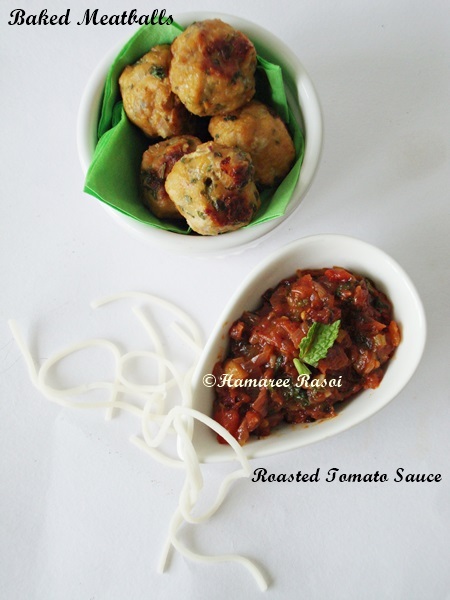 Toss all vegetables and season with salt and pepper along with soya, chilly sauce. Add boiled noodles and stir fry on high flame for 5 minutes. And let this cool. For those who have leftover noodles with them, take gram flour in mixing bowl and initially add very little water and stir to mix well. 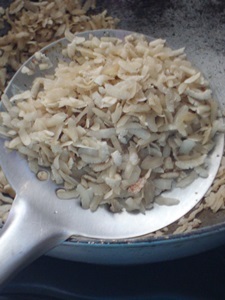 When you come to a stage where no lumps remain, again add little water at a time and stir well to make a smooth batter. Why I emphasized enough to add little water at a time is to get rid of lumps. Add salt, pepper, baking powder and onions, mix well thoroughly. Add leftover noodles and use a fork to mix well. 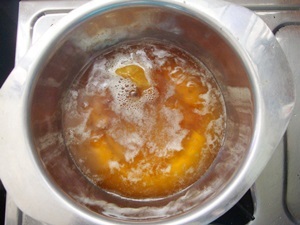 Heat oil for deep frying, check the oil temperature by dropping a noodle strand, if after few seconds it floats on top and turns golden then it means oil is ready. 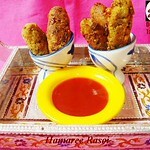 Use fork to drop small portions in hot oil and fry until golden brown. 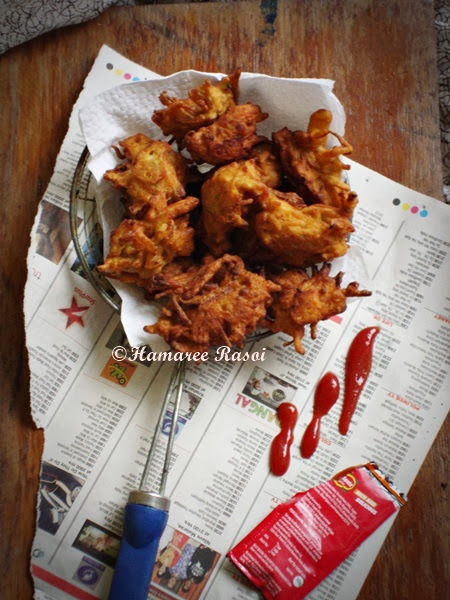 Place the pakoras in a kitchen towel and serve them with tomato ketchup. 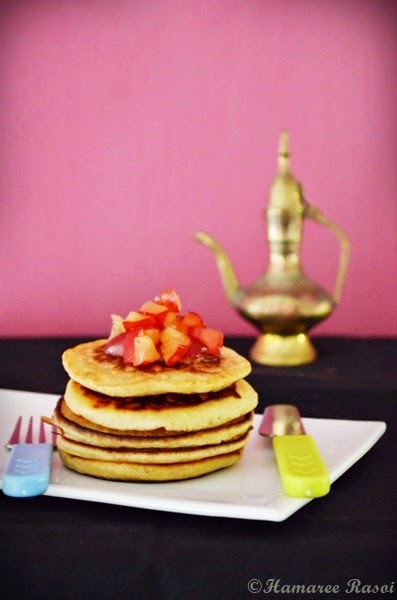 If you feel batter is little runny then you may add 1-2 tbsp cornflour for more thickness. 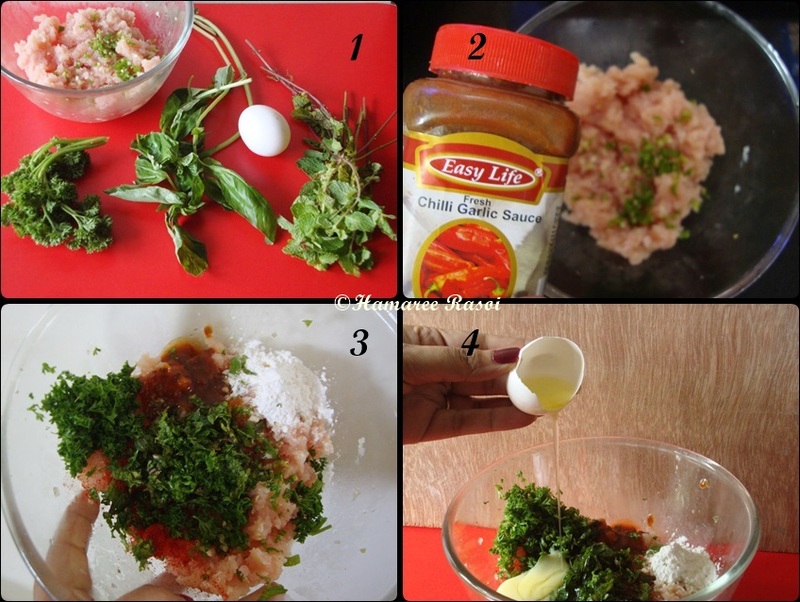 You can add grated cheese to make it more yummy. 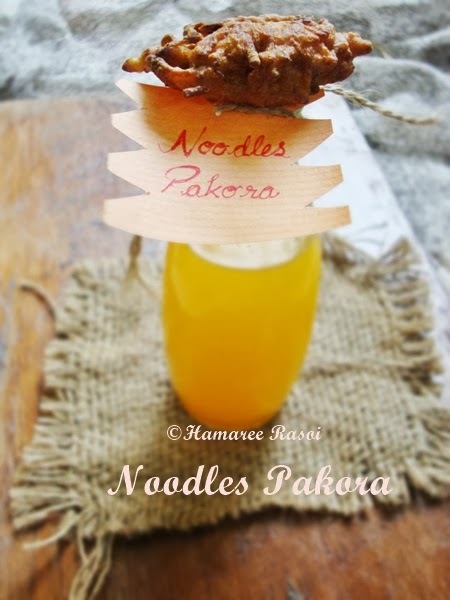 read more.. "How To Make Noodles Pakora"
Banana-Oats Smoothie is ideal who don't have time to sit and have their breakfast. So this is quick fix nutritious breakfast for those on the go. I have become a stickler for smoothies lately. As I am on a mission to loose 3-4 kgs weight before my Durga Puja trip. Well do you know the difference between Milkshake and Smoothie? 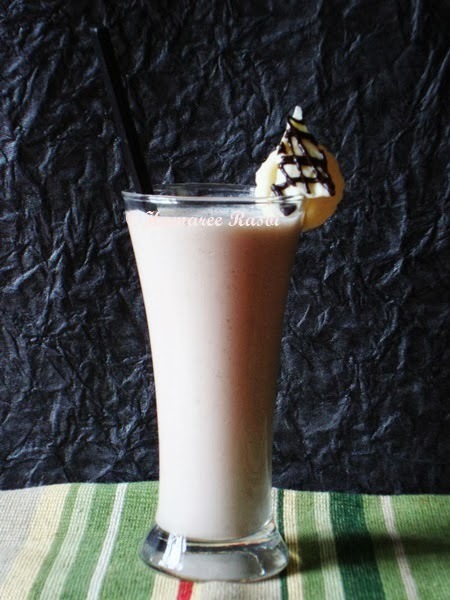 A Milkshake is blended with Milk, Ice-cream, any flavour or may be fruit. Dairy based based drink made with Milk, ice-cream or both. Chocolates are the very common ingredient in the milkshakes. 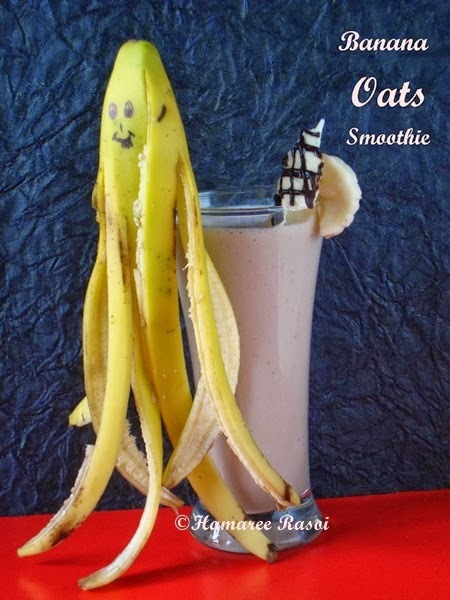 On the other hand Smoothie is typically made of fruit /frozen and usually have lower fat and sugar content. Combine all ingredients into a blender and blend until smooth. Serve in a tall glass and serve it a slice of banana. You can also freeze it and use it later. Perfect fix for kids when they return from their school in the afternoon. In case you are using frozen bananas you won't need ice cubes. 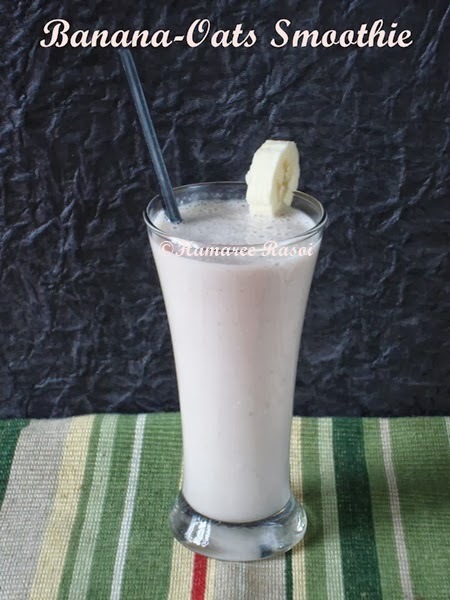 read more.. "Banana-Oats Smoothie "
Last weekend I had already started to plan about my upcoming Calcutta visit for the Puja vacations. For those who joined in late or not quite familiar with Bengali culture, Durga Puja to us is what Christmas to Christians or Eid to Muslims or Guru Purnima to Sikhs. It's the festival we all look up to throughout the year. 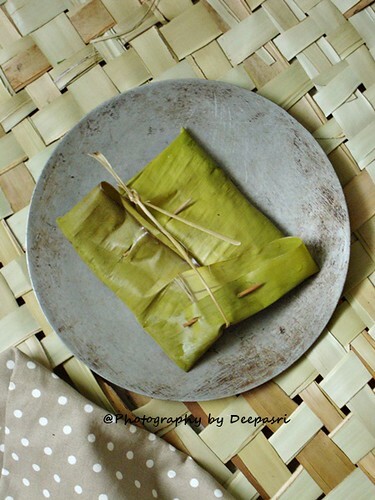 For a Bengali in Howrah (near Calcutta) or in Honolulu, if there are more that 3 families, they make it a point to celebrate this festival together. 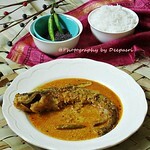 The joyous mood in West Bengal will sure make your eye balls come out ! 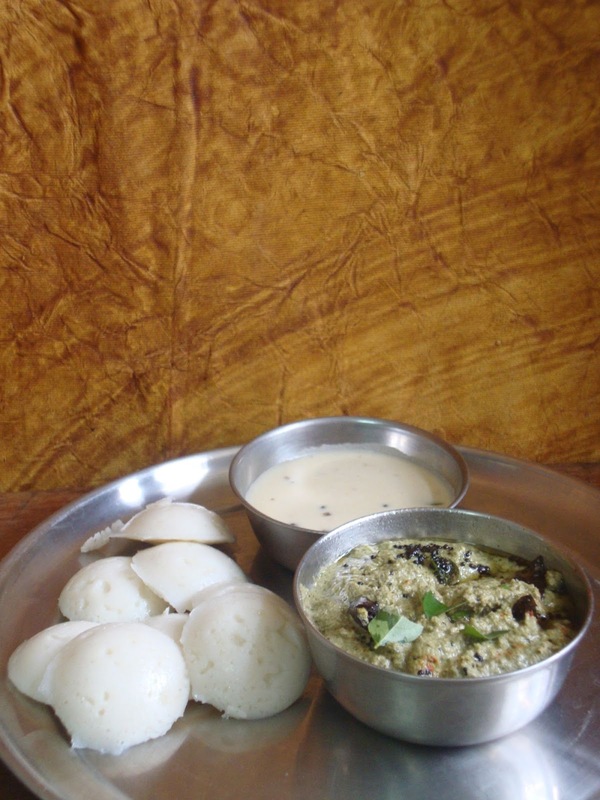 The best part the culinary extravaganza that is a part and parcel and anybody with a sane frame of mind won't mind eating out and hopping pandal to pandals. 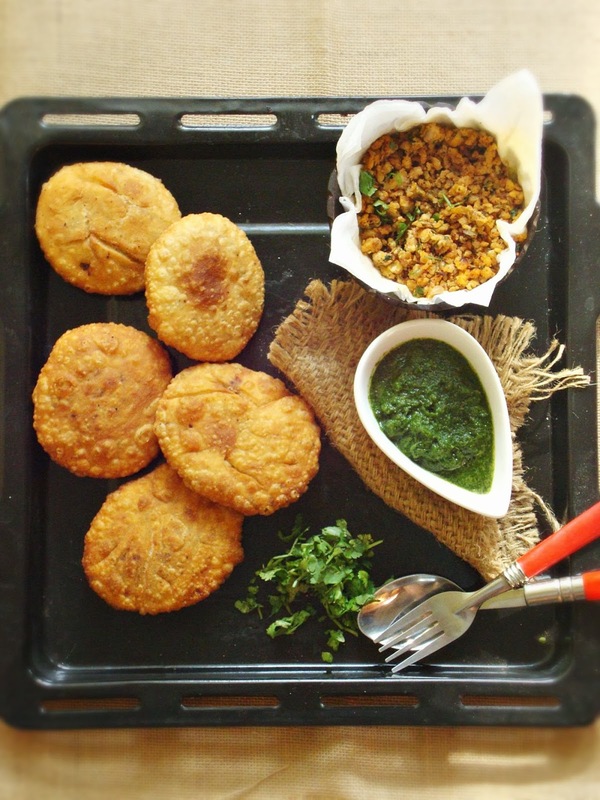 Ohh I can continue till the day ends and you will be bored to death so coming back to today's post "Khasta Keema Kachori". Khasta means 'crispy', Keema means 'minced meat' and Kachori is a snack which is stuffed with spicy filling. And then deep fried in hot oil. Sift flour, salt, soda and make a well in the center. Add enough water and knead into a soft dough. Wrap a damp towel around the dough and keep aside for 20-30 minutes. Transfer the boiled keema onto a sieve or colander and let it stand so that all the excess water drains out. 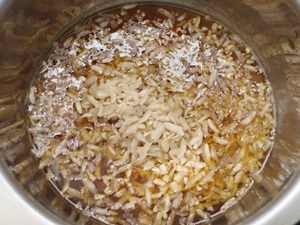 Heat oil in a pan and add grated ginger and garlic paste. 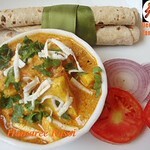 Fry for a minutes and add onions, fry these together till onions are half done. 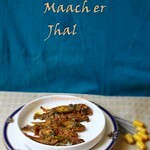 Add keema along with chilly powder, garam masala powder and cook for a couple of minutes. 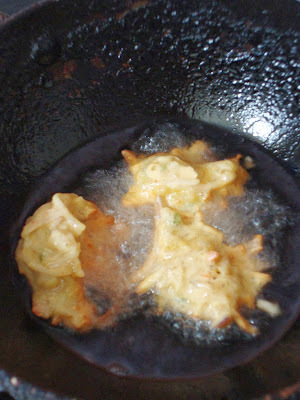 After 5-6 minutes you will see the color has changed a bit, keep frying the filling till it becomes dry. Remove from heat and let it cool down. Later add lemon juice and coriander leaves. Mix well. Filling is ready. 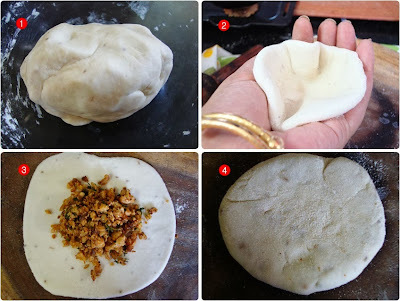 Divide the dough into 12 equal portions. 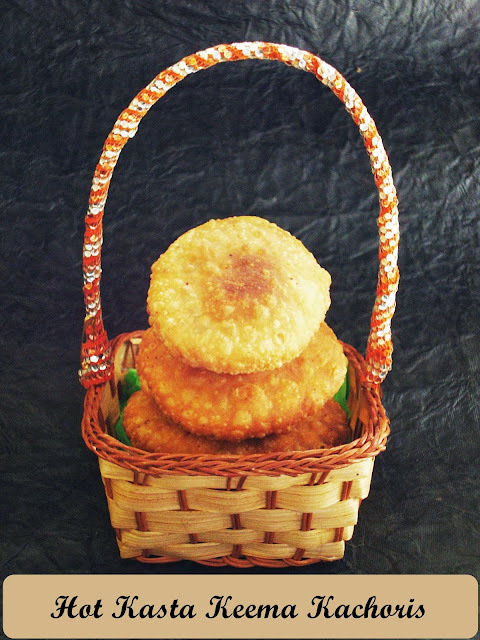 Roll out into small puris in a way that they are thinner around the edges and thicker in the center. 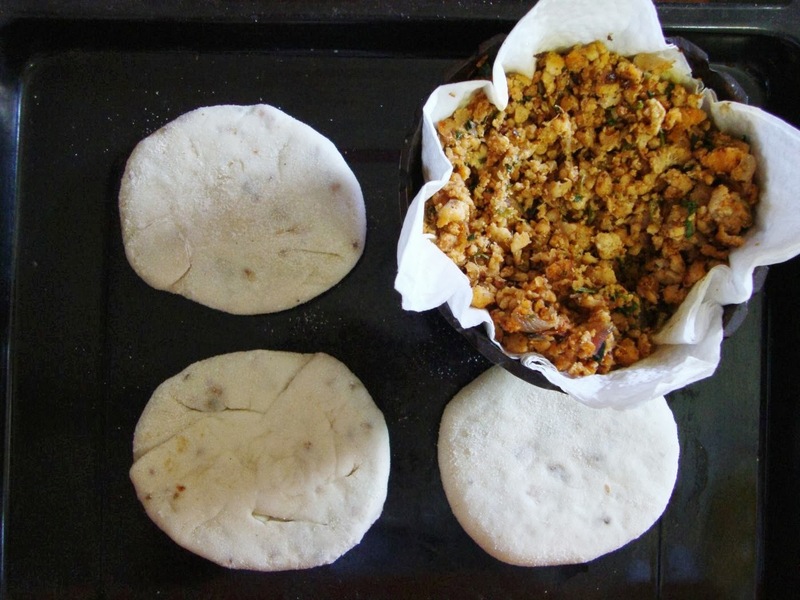 Place 2 tsp of filling in the center and pull the edges of the dough to wrap the keema filling. Dust the counter flour and flatten the stuffed puri little bit. Take enough oil for deep frying and heat oil on low flame. Carefully slide 1-2 kachori into the hot oil and after they start to puff on one side, flip it over and cook until golden brown. Place the fried kachoris on a kitchen towel. Fry with the remaining filling. 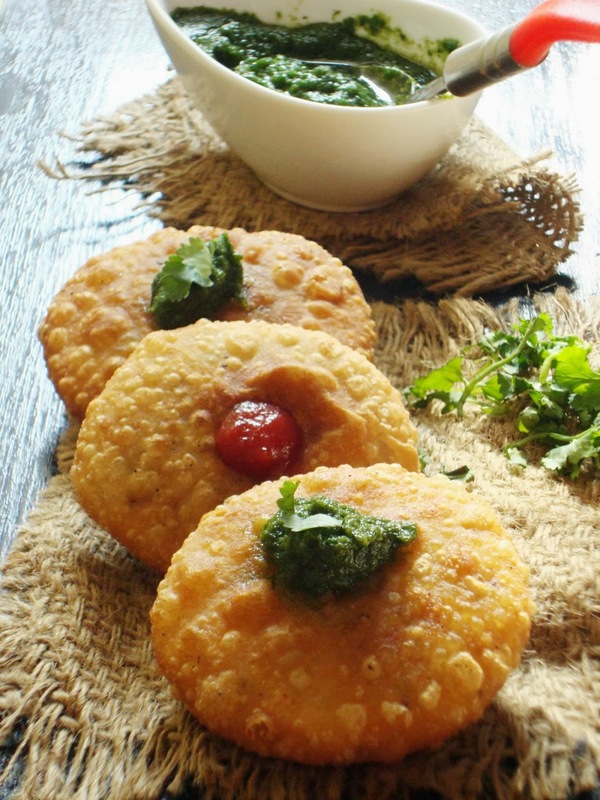 Serve these hot Keema kachoris with either Tamarind Chutney /Coriander Chutney or Tomato ketchup. 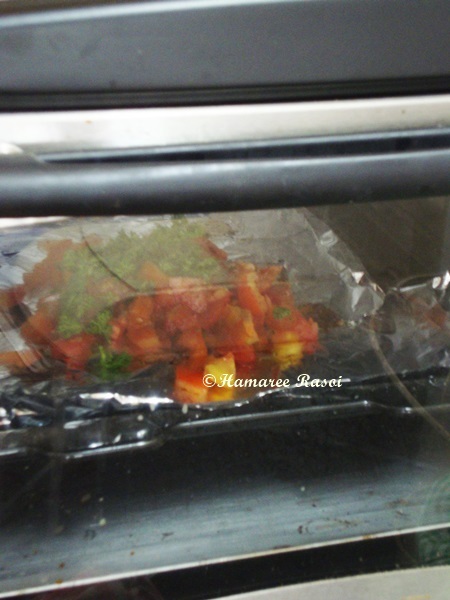 While making filling (keema) make sure there is no moisture. Fry till it becomes dry. Do add baking soda in the crust dough as it gives crispy crust after frying. Do not fry the kachoris on high flame as it will make plenty of small bubbles on the surface and it will remain half cooked from inside. 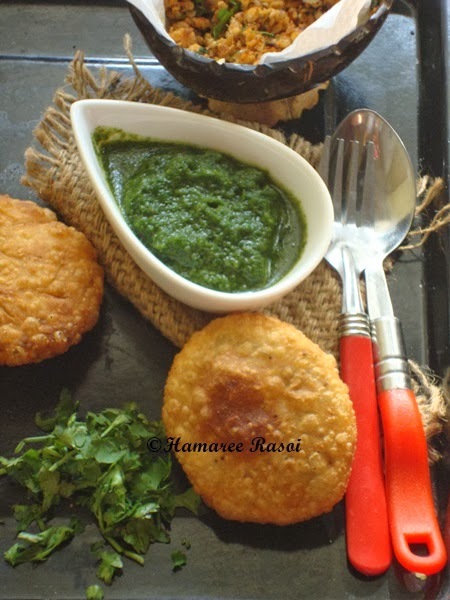 Do not over crowd the frying pan, at a time 2-3 kachoris should be dine. 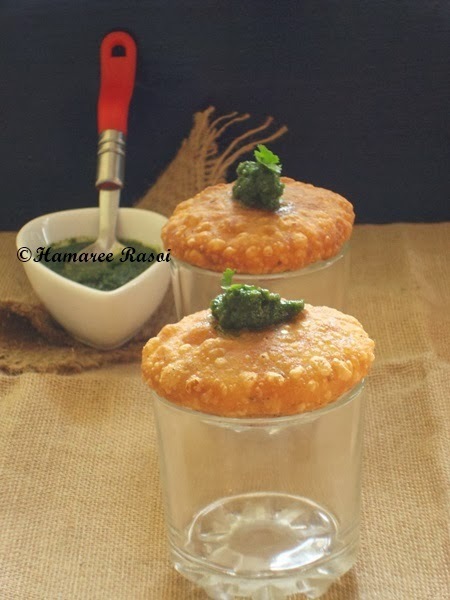 read more.. "Crispy Keema Kachori"
I have a confession to make. I am crazy about milkshakes in any form. 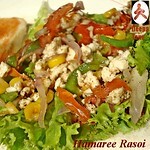 Particularly during summer time I crave for shakes be it at home or in ice-cream parlour. My son is fond of milk so touchwood I have had trouble running behind him with a glass of milk. 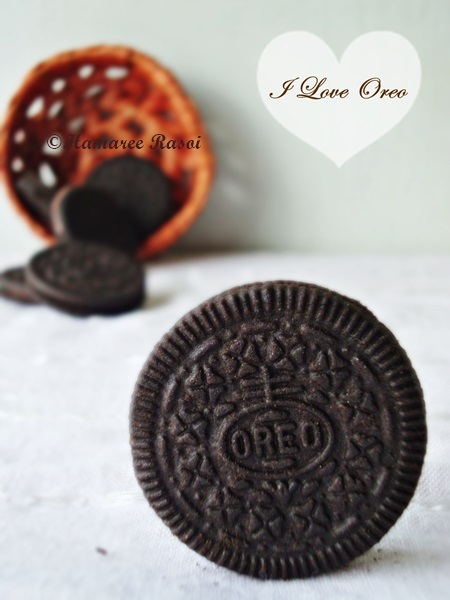 My love for Oreo cookies is beyond words. 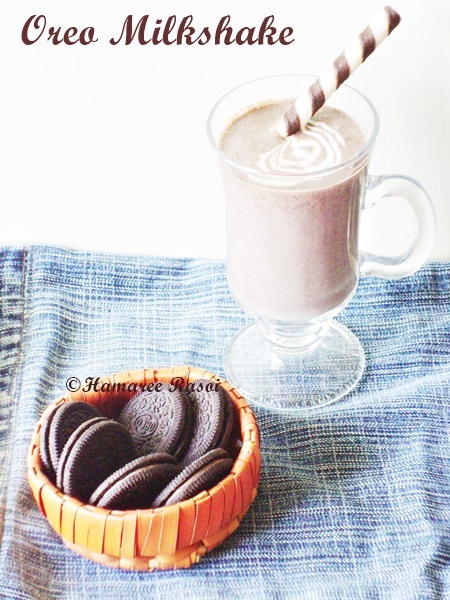 Few months back I tried out the Oreo milkshake and Abhi got himself involved in the process to learn the process. I also do not stop him to enter kitchen as sooner he learns to cook/ enjoy making 'no cooking' dishes or easy peasy dishes it's better for me ! 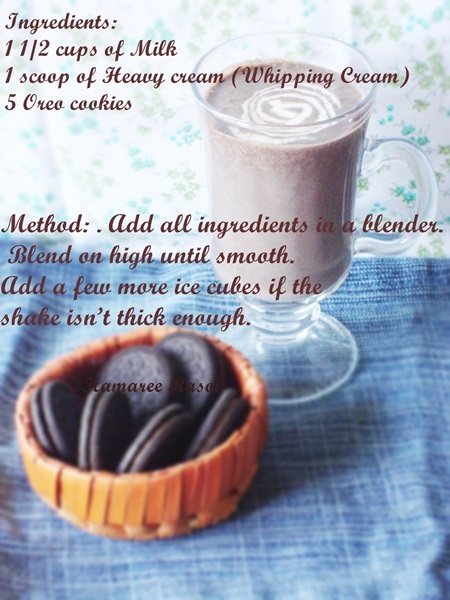 Actually it takes few seconds to make this awesome milkshake. So I was a bit hesitant to post such an easy fix but then followed my heart. I don't like my milkshake to be too dark so I have added only 5 which is good enough still if you want more feel free to add more cookies. Put everything in a blender or a milkshake maker, blend until combined and frothy. Pour into a tall glass and you may add roughly crushed Oreos. Serve immediately. 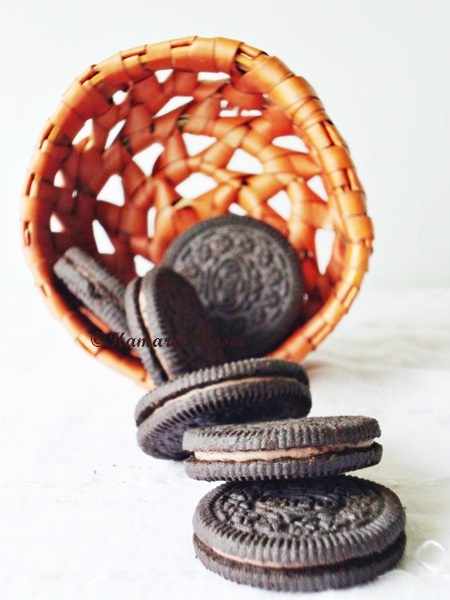 Do you dunk you Oreo in milk? 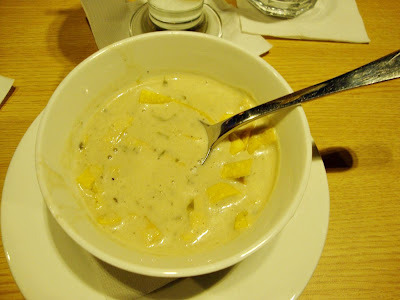 read more.. "Oreo Milkshake "
read more.. "Spaghetti And Meatballs With Roasted Tomato Sauce"
read more.. "How To Make Orange Bundt Cake "
In India during festivals you just can't stay away from making payasam /kheer. Kheer is basically Indian traditional dessert which consists mainly milk, nuts, sugar and sometimes we add flavours to enhance the taste. I have a collection of few varities in my earlier posts. I love the simplicity of this Aval /poha kheer as it takes very less time to cook. My Nani (Grandmother) makes it with jaggery so do I. I generally use thick variety of poha for making kheer but you can make with thin also. 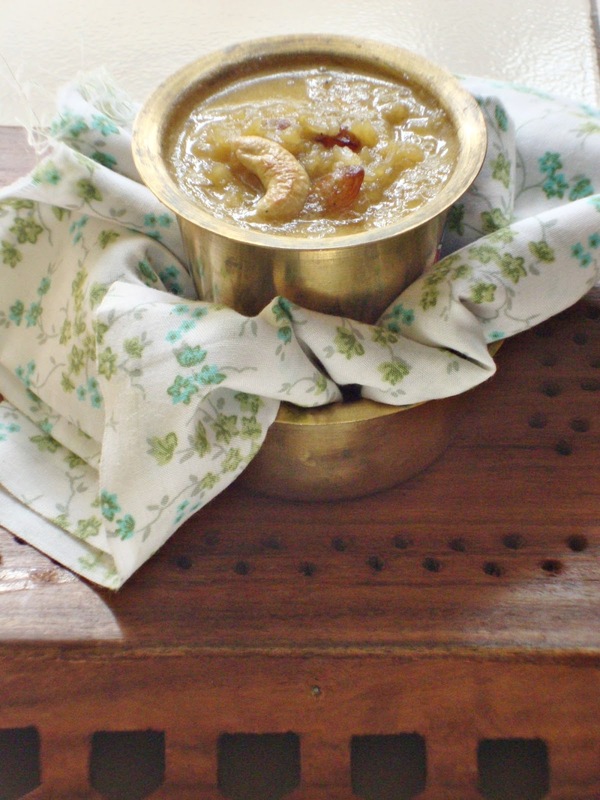 Do make this ultimate kheer this Ganesh Chathurti and see it yourself how easy it is. 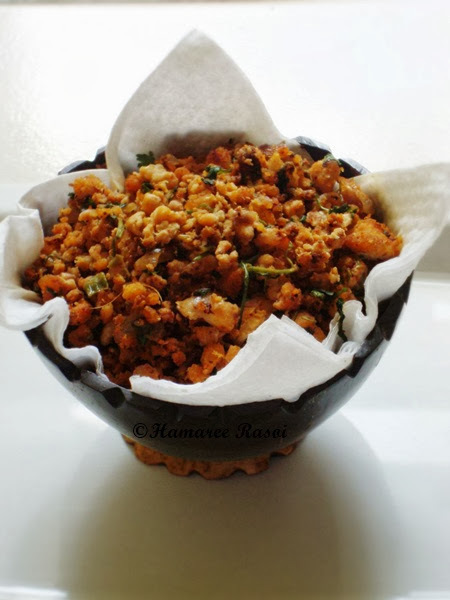 Heat ghee in a pan and add cashews first, fry till golden brown. Keep aside. And fry raisins till they swell up. Keep aside. 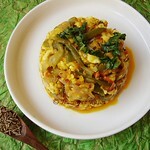 Fry poha in the remaining ghee by keep stirring regularly for next 2-3 minutes. 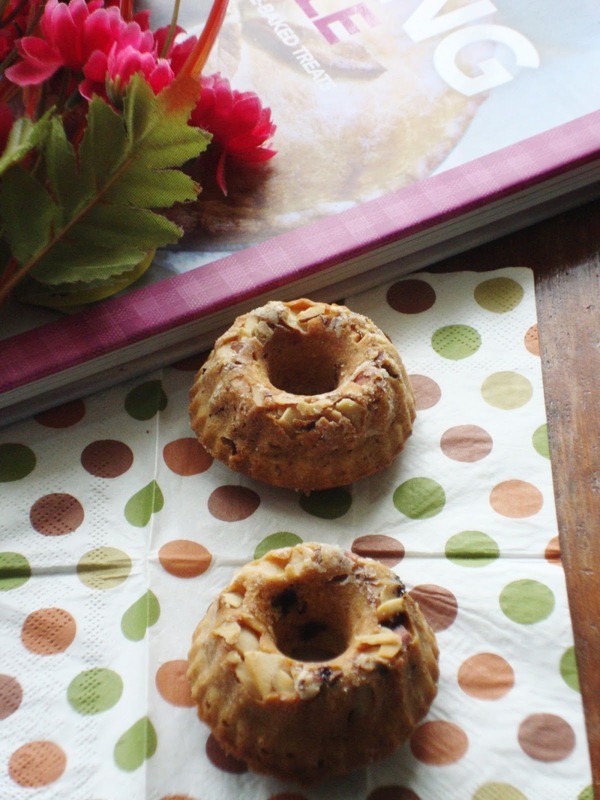 Once they turn light brown turn off the flame.Take a vessel and fill 1/2 cup of water along with jaggery, cook on low flame for few minutes (2-3). 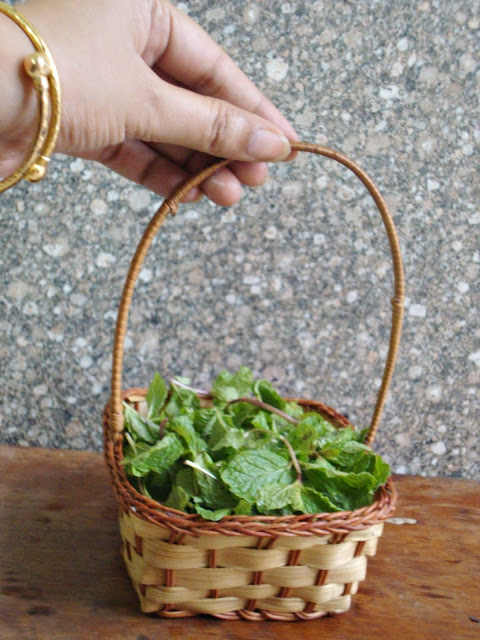 Strain the jaggery syrup to remove any dirt or waste particles. 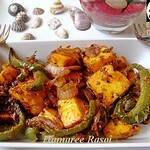 In the same syrup add roasted poha and put it on burner on low flame. Add milk into it and keep stirring in between to avoid getting it burnt from the bottom. 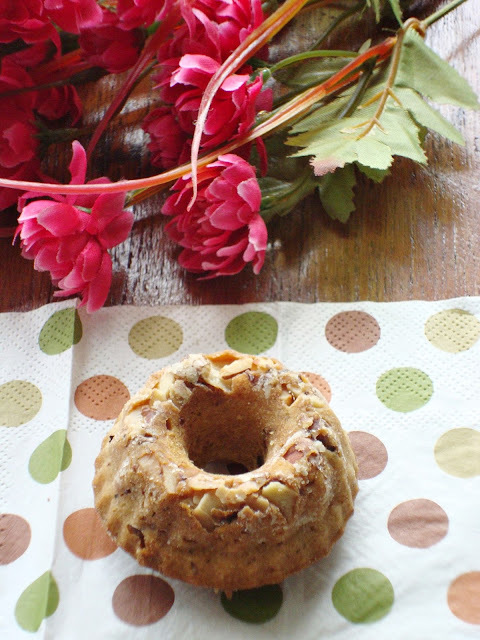 After 7-8 minutes add cardamom, fried cashews, raisins and mix well. Turn off the heat when you get right consistency just remember that kheer gets thickened with time so be sure of your desired consistency. Serve warm or cold. 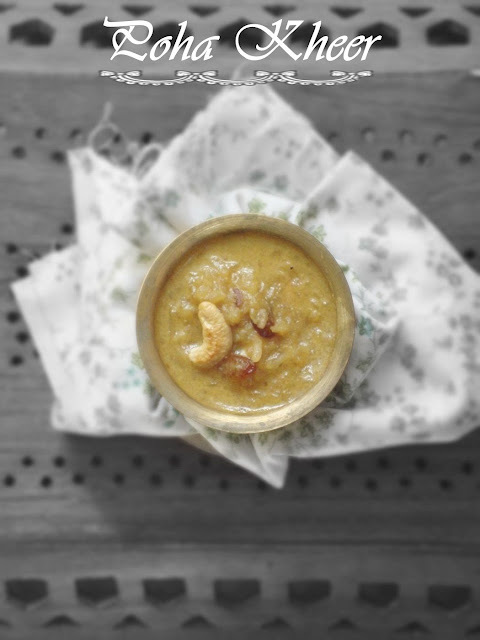 read more.. "Poha Kheer |Aval Payasam |Ganesh Chathurthi Special"
It's been almost 3 months since I have settled down in Chennai and have started to get myself acclimatized with this City. One thing that I realized is that similar to the warmth in the climate there is a lot of warmth in the hearts of the people over here. 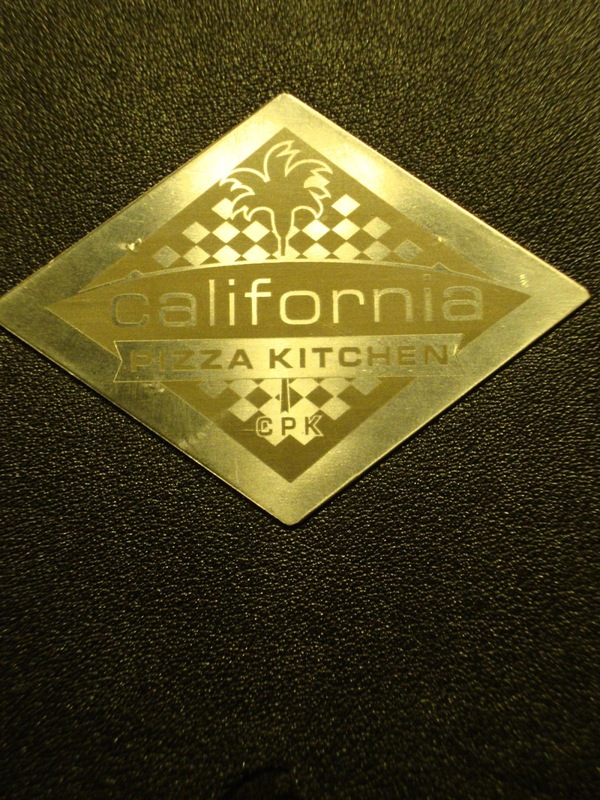 So as I was settling down with my family and occasionally posting a few recipe, I got a call from Mr. Krishnamurthy ( AvianMedia) inviting me to review this newly opened restaurant in Chennai called California Pizza Kitchen ( CPK). 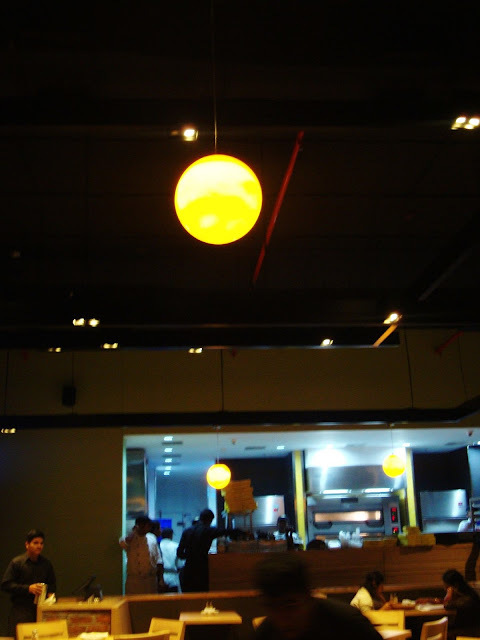 "Wait a minute, I have been to Bangalore's branch many a times and liked their Pizza varieties. So why not in Chennai?" Checked with few friends who are based in Chennai if they can make it and Pari nodded in affirmative so more fun on the cards! California Pizza kitchen has opened on the ground floor at Phoenix Mall and well visible from the outside so you can't miss it when you enter from the left wing of the mall. So,as we went in we were greeted by a smiling hostess who guided me to our table. Then Mr. Krishnamurthy joined us and informed us about the Franchisee in India who also owns the chain of Hard rock cafe and Pink berry branches in India. Then we met Chef Kuldeep Bharani (AKM of South division) who had arrived all the way from Bangalore to supervise the review. With a smile on his face he took us on the delicious food journey for next 3 hours. So as soon as we sat we were presented with welcome drinks Party punch and Cucumber delights. I tried Party Punch which was amazingly tasty and comforting. 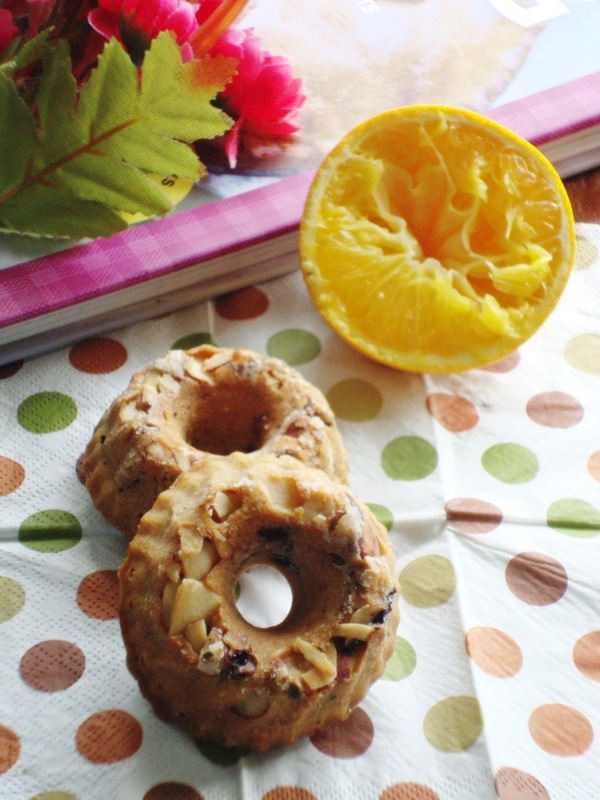 There was a mix of tangy taste with a hint of mild sweetness to it. It was well decorated to make it look inviting. 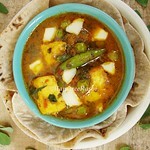 Pari also liked the Cucumber drinks and said that it was a very cool drink to have with meals. The pictures speak for themselves so all I can say is that the non alcoholic drinks set the tone for the reminder of the evening. Next came, Mediterranean Foccacia with Cheese dips, honestly speaking this set the tone for the evening. The breads were soft yet well baked. The dip was also just delicious with the cheese being tasted as a freshly prepared. I think I could let the Chicken wild race chowder soup pass. It was not extraordinary in taste but gives a comforting taste to the buds. Then came came Charqui grilled chicken which tasted soft and juicy but by looks it got slightly more charred than my liking. But overall it tasted as a good grilled chicken should be. 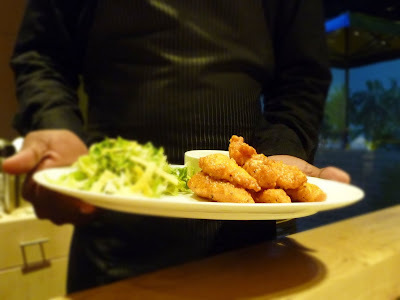 However it was followed by the best appetizer for the evening that was Spicy Chicken Supreme. Just by having a piece of it in my mouth made me feel so good. The chicken was just rightly cooked and once I have put it in my mouth it just melted. 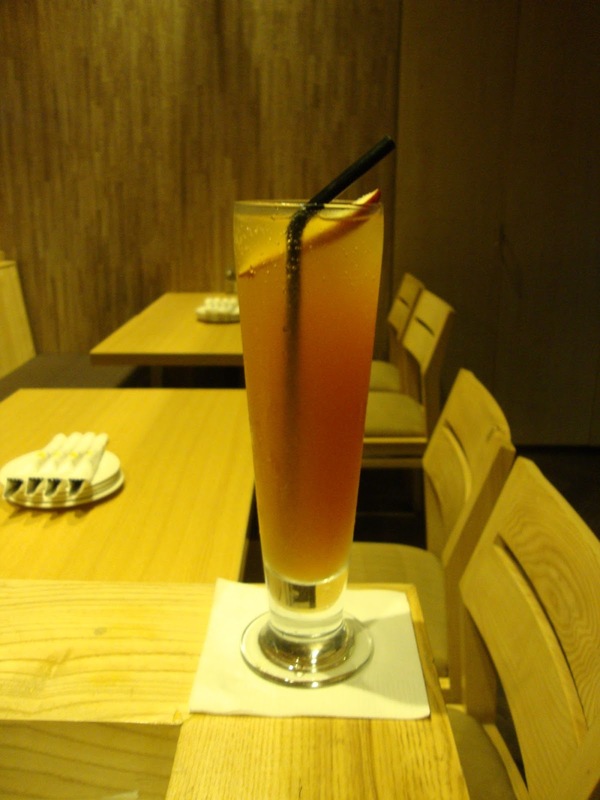 Every type of garnishing that was used was just right in proportion. Even the sauce was so tasty and tangy that I asked for it more than once. Lettuce Wrap( Veg) dish that followed was looking vibrant , while having a filling of cottage cheese, chestnuts and a hint of olive oil. 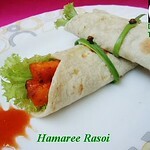 The lettuce was fresh and the fillings were well mixed for a delicious wrap. Another salad with Pita bread was also served but we found the bread too hard to chew. 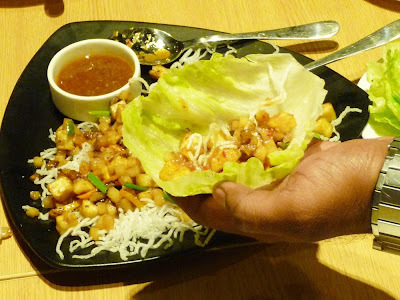 Therefore as an overall opinion of starter and salads I would recommend the Chicken supreme for the Non vegetarians and the Lettuce Wraps for the veggies. Now comes the main course that is Pizzas. It's signature dish is the California Pizza which comes as a multi grain dough option as well. 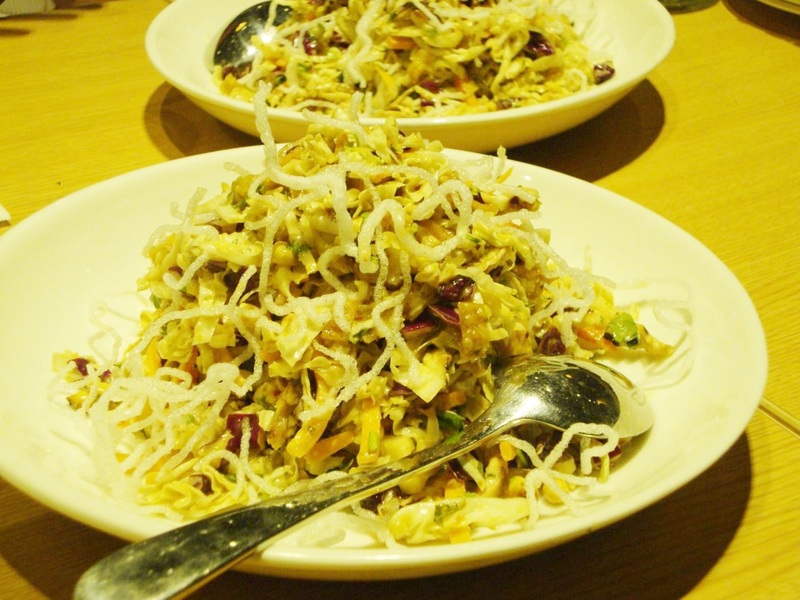 The toppings were lavishly spread and by taste it was simply awesome. You could easily make out why CPK is layers above in quality and taste when it comes to pizzas as they are generous in ingredients and the taste stands apart from the run of the mill pizza joints. Then came Pepperoni which feel the highlight of the entire course of meal and without a doubt it was the preparation of the day. My thought was that it tasted simply awesome and to add to this the Chef Kuldeep also seconded that this Pizza is the favourite of the Franchisee owner. Now if the owner reveals his favourite course then it must be special. So after this we were served Chicken Fajita Pizza and Toastada Pizza which were also good to taste. A special mention about Toastada Pizza which is also called hot and cold pizza with a generous dose of tortilla chips, ranch dressing cheddar, fontina cheese served with fire roasted tomato salsa. I believe this is another pizza veggies would love to indulge. 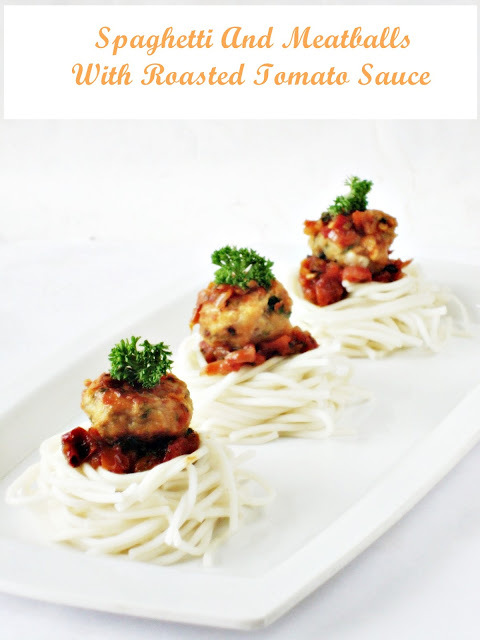 The Chef served us with Pasta named California Kung Pao which we could taste a little as we were almost done with the main course and awaiting dessert, So till then another round of smoothies arrived. They were Peach Iced tea and Strawberry smoothie. Both were much needed to quench our thirst amongst all the food we ate. 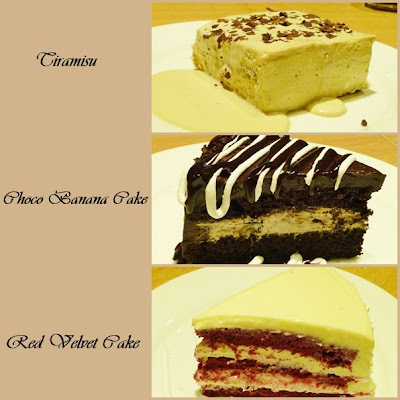 Then came the desserts : Red velvet cake which was not at all heavy, I shifted my attention towards Tiramisu, which had perfect balance. However I had remembered the Choco Banana cake from Bangalore which was the showstopper as far as dessert is concerned. 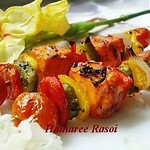 Simply loved the taste. I admired it then and my opinion did not change a bit even now. 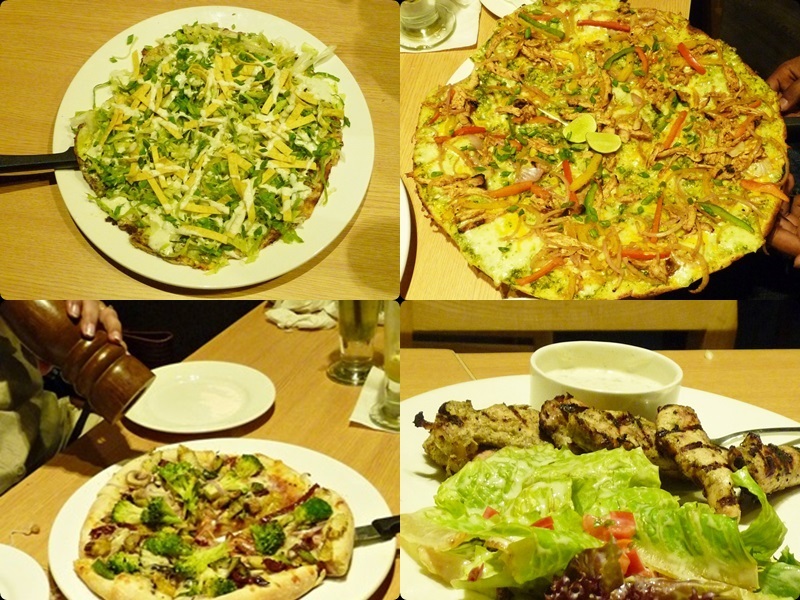 Overall I must admit that CPK has maintained it's quality if not improved more in last one year. It's surely a place worth giving a try and then judge it for oneself. 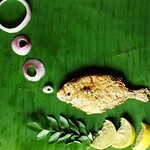 Being a foodie myself made me realize that Chennai too is becoming a city with a variety of good food destination. So CPK adds to this fact as a place where you could have a good meal and time. 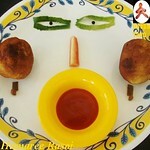 Here is Pari's take on this Food tasting session. Thanks Pari for sharing some pictures. PS : The above opinion is entirely mine and have tried to review with an objective frame of mind.The other dishes in the menu was not tasted by me so I reserve my views for another day. read more.. " Restaurant Review| Chennai |California Pizza Kitchen, Phoenix Mall, Velachery"
Wash mint leaves thoroughly and keep aside to retain some water. 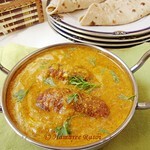 In a pan add 1 tsp oil and add chana dal along with green chillies. Fry till they turn golden brown. Let this cool down. 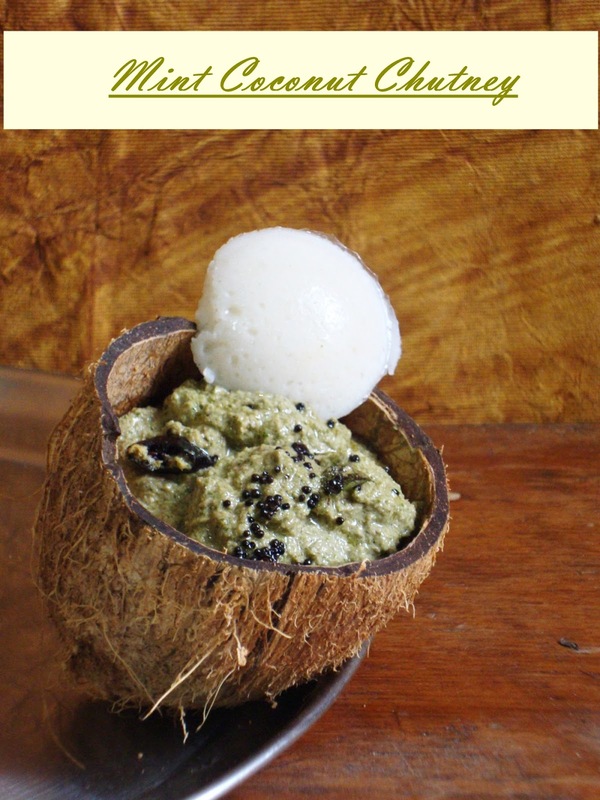 In a grinder put pudina leaves, coconut, roasted chana dal, green chillies and add little water at a time to make a smooth paste. Add salt and mix well again. Heat oil in a pan for the seasoning, add mustard seeds and let them crackle. Followed by hing, red chillies, curry leaves and turn off the heat. Pour over this tempering over chutney. 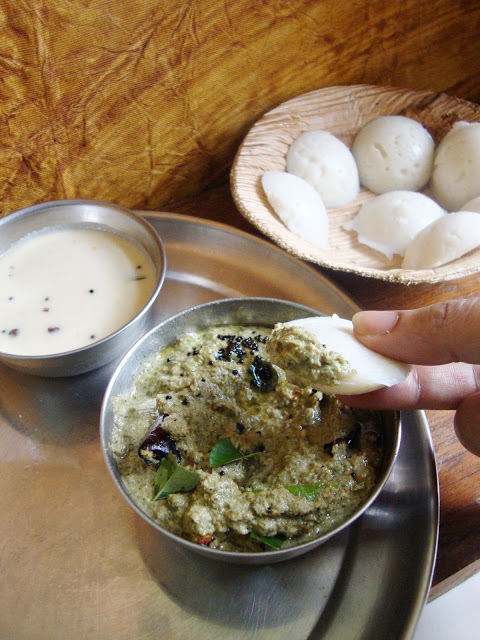 Pudina Coconut Chutney is ready to be served with idli or dosa. read more.. "Mint Coconut Chutney"